The name for this dish may sound unique and it is; but I think that even though it is a bit more complicated in making than most of my recipes, the end result is worth it. It’s also very versatile and lastly, the “ball” part can be used for any recipe requiring meat balls and the ” biscuits” recipe for any other dish requiring a light and fluffy biscuit topping. You don’t have to serve this dish with the biscuit topping, but I find it awfully good. Also, I use the ground chicken sometimes, but the ground veal or lamb is even tastier. So, as I said, this recipe is very versatile. This recipe is divided in 4 parts. Sauté the above ingredients in the hot olive oil in a 10 to 12 inch oven proof skillet over medium high heat for about 5 to 8 minutes–till onions are soft and glossy. In a medium sized bowl, let soak the bread crumbs with the milk or cream for 5 minutes. Start with 1/4 C. crumbs. When soaked, add the remaining of the ingredients, mix and then add your ground meat and mix well. If your meat looks too soupy, which ground chicken can be, add up to 1/4 C. more crumbs. Make 1 ½ inch in diameter balls (there will be around 20 to 24 of them). Remove the balls to a platter and place aside. Add the butter or olive oil to the same unwashed skillet over medium heat and stir in the flour till it’s well mixed (about a minute or two) and then over medium-high heat add the liquid ingredients and spices. Once again stir slowly till the ingredients are well melded into the sauce. At this point add your yogurt and once again stir till well combined and seems very smooth. Put the skillet aside while you make the biscuits. 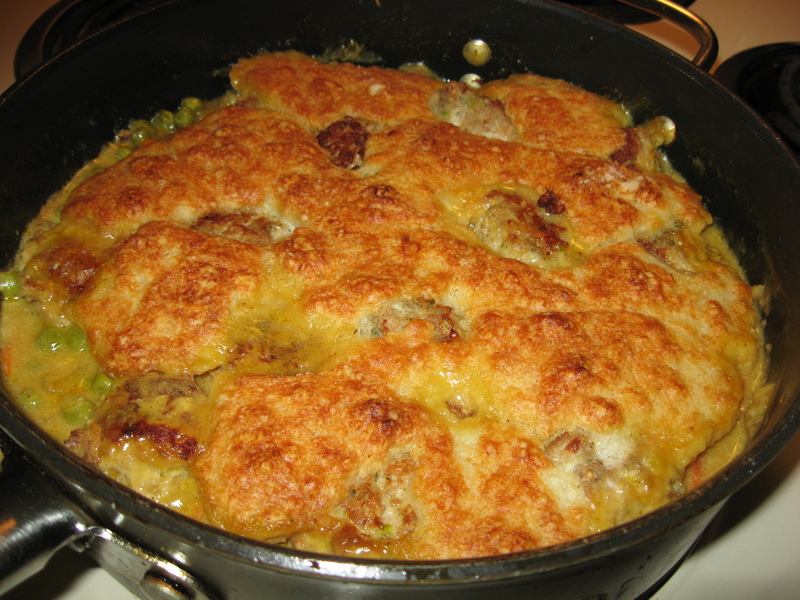 However, if you want to serve it without the biscuits, put the veggies in the sauce and top with the meatballs. Place in 375 degree oven for 25 minutes. Serve over rice or noodles. In a bowl whisk the flour, salt and powders till well mixed. Cut the butter with two knives in the dry ingredients. You can also use your blender at pulse to do this. When well blended use a large spoon to stir in the yogurt until the mixture forms a ball. Drop tablespoons of the dough on top of the stew. Now put your skillet in a 400 degree oven for about 25 minutes. Serve in the skillet with a pretty napkin tied around the handle. I serve it with a nice light green salad.